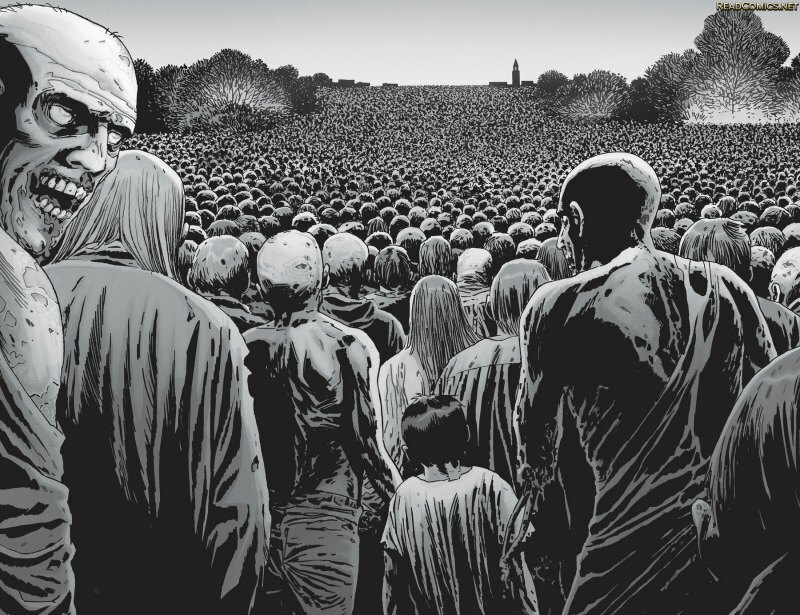 THE SCENE: Thousands of zombies plod toward Alexandria. This week I got to thinking about the last time the series really wowed me. 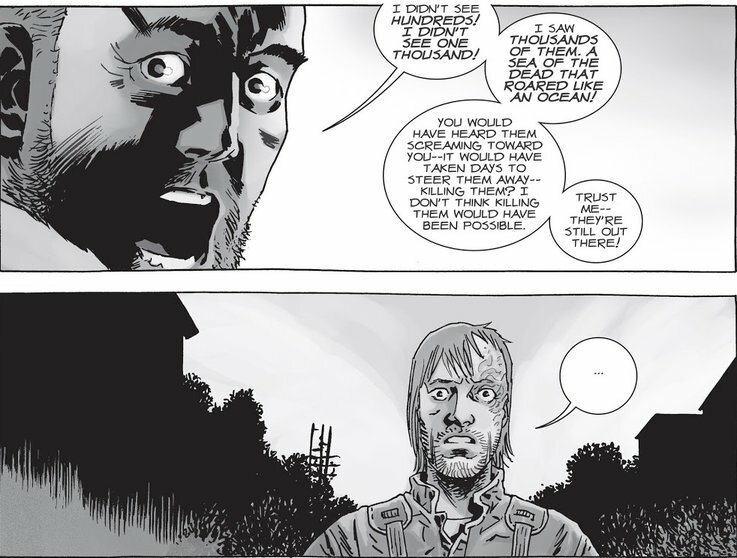 The above two-page spread from The Walking Dead #162 jumped out almost immediately. Whether you call them zombies, walkers, roamers, or something else entirely, after all these years it can be pretty easy to take these things for granted. By this point in the series it’s been so long since the outbreak that the characters have, by and large, learned to cope with the presence of the undead in their day-to-day lives. We’ve seen them stabbed, shot, and maimed in so many different ways. At times they almost become an afterthought. One of the elements that makes this image so amazing is its depth. It just goes on…and on…and on. We start out with our typical level of gory and shadowy detail in the foreground. Then as we move further into the shot, you can literally count the heads. Until you can’t. It just becomes a blur of decaying flesh and bone. What seals the deal and really makes this image horrifying is our looker on the left. The backs of a bunch of people’s heads aren’t scary at all. Especially if the threat is moving away from you. But that one straggler is looking out at the reader. He’s looking at you. He sees you. His eyes, dead as they may be, make you a part of the scene. They allow you to feel a piece of that abject terror our heroes do. With one raspy grunt and a turn, he can start a domino effect that can bring that entire ocean of the dead crashing down on you. Note that there’s one walker on the right hand side whose eye we can see just slightly. There’s your second domino. Ironically, even in an ocean of the dead, it’s still the little things that scare us the most. This entry was posted in Panels of Awesomeness and tagged Charlie Adlard, Cliff Rathburn, comic books, Dwight (The Walking Dead), horror comics, Image Comics, Panels of Awesomeness, Rick Grimes, Rob Siebert, Stefano Gaudiano, The Walking Dead, The Walking Dead #162, The Walking Dead Vol. 27: The Whisperer War, zombies on 07/19/2018 by primaryignition.